Download the latest version of hashcat binaries from here - v3.10 at the time of writing. Unzip the 7z file and open a command prompt at the unzipped location. MANGO is my domain name and neo is the user who was logged into the system. I saved the response into a text file named hash.txt in the hashes folder created earlier. I wanted to show both scenarios here, starting with the worst case - not having the password in the list. For the sake of the the demo, I extracted a subset of the passwords from example.dict that comes with hashcat and saved it as password_list.txt in the hashcat folder. For the first run, the password_list.txt does not have the user password. 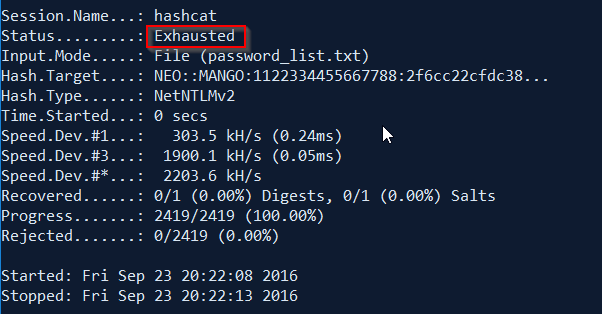 If you don’t specify -o switch, the password (if cracked) will be stored in hashcat.pot file in the hashcat folder. 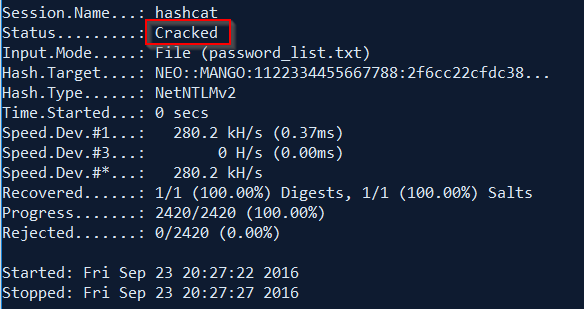 If the password is not found, this is what you see once hashcat completes the cracking. For the next run, the case if I have the user password in my password list. I edited the password_list.txt and appended the user password (I created the user, remember :)). To view the cracked password, see the cracked.txt file in the folder named cracked. The success of cracking the password using this method solely depends on whether or not your password list is good enough.